Generally speaking, we’ve rejected the idea of dieting. Most have heard the research enough or have been on enough diets to believe the fact that dieting is futile. We know the only substantiated claim on dieting is that it actually causes weight gain, not weight loss. There is literally no such thing as a good, successful or effective diet – it’s all a big oxymoron. The diet industry has heard all this too. In order to stay in business, it’s dropped the word “diet” and substituted for words and statements like “life-style change”, “sustainable program”, “healthy eating plan” or “clean eating”. Essentially dieting has gotten a face lift; a really sneaky, seductive and alluring face lift. What makes it so darn appealing is that the promises are less about weight loss now and more about helping you become fixed, less broken, more whole, more clean, more YOU. They’ve coopted the non-diet message and cheapened it by selling you a counterfeit version, still promising this peace with food and your body that you probably really, really, really want. So when this diet faking to not be a diet fails you, now you really feel like you’ve hit rock bottom. This is the point where a person might trying ANYTHING, like EVEN Intuitive Eating (IE). What’s there to lose right? And then you find out the first principle of IE is “Reject the Diet Mentality” and you start to better understand what a diet actually is and what it isn’t. It’s restrictive – cutting out foods, food groups and ingredients. The restriction could also come in the form of dictating food combinations, how often you can have a food or what time of day you can or can’t eat. It tells you exactly what to or what not to eat and how much of it you can have. It promises really dramatic or miraculous results like “cure all inflammation!”, “heal your gut!” or “dramatic weight loss!”. It’s a bunch of pseudoscience explained in really complex terms so you feel like they are smart and know how to help you (but really just want your money and loyalty). It requires counting and numbers – macros, grams, calories, hours until you can eat again, etc. It causes you to avoid social situations because of food rules. You can’t go out to eat, travel or have someone else cook for you. Basically your life has to fit into your food rather than food fitting into your life. Your focus and attention everyday is on how to manage your food rather than building a meaningful life. It’s emotionally distressing. It’s totally true – dieters report higher anxiety scores and more depressive symptoms than non-dieters. You are much less resilient, adaptable and flexible to life when you are rigid and militant with food. It encourages allegiance to outside rules instead of encouraging trust with your own ability to self-moderate. It tells you that you are powerless over food and that you can’t be trusted. In essence it makes you dependent rather than independent and self-directed. In my opinion, that’s the saddest casualty of dieting. It encourages a lot of supplements, meal replacements, pills or powders to add to meals and snacks or to replace them. Usually they are the ones selling them to you too (HUGE red flag). It’s not sustainable. Do you really not want to eat carbs for the rest of your life? Or go without a treat or a burger? If you say no, it’s not because you don’t have enough willpower or self-control. It’s because you’re human and want to live a normal life. That’s totally OK. Here what it’s not: Basically the opposite of everything above. It’s not a way to make peace with food or your body. Healing from disordered eating and poor body image is an inside job. No one can give you a plan for how to do that, but you can have a compassionate professional help you connect with yourself and your natural ability to respect and care for yourself. It’s about the food, but yet it’s TOTALLY NOT ABOUT THE FOOD. Disordered eating is an adaptive response to a wide variety of triggers. Nutrition therapy helps you uncover why you do what you do and allows you to adopt behaviors that are more effective and supportive. Now that we’re clear on diets, I want to give you links to some fantastic reviews about popular diets from some of my fellow dietitians. If you’re still struggling with rejecting the diet mentality, hopefully this can give you objective data to appeal to logic and help you reason your way out of any allure to try them. Gluten – Let’s Keep It Real via Me! You may by hearing a lot of positive things about these diets and hopefully these reviews provide perspective and a reasonable second opinion. There is always something behind a diet and don’t be afraid of a little healthy cynicism. 1. Keto is not restrictive. It doesn’t cut out foods, only processed food-like "products". Some foods are limited to special occasions and small amounts, but only because they have detrimental effects to health. 2. I can eat what I want and as much as I want, as long as I am eating mindfully and intuitively. 3. I have experienced some pretty dramatic results (not weight loss). It took time, but it was and is worth it! 4. It is backed by sound science and does not support the diet industry or the junk food industry. 5. There is no counting required. Calories, macros, carbs, hours between meals? Who cares! Eat intuitively! 6. It’s easy to find a satisfying option when eating out or at parties, and allows for accepting hospitality by eating something that might not be entirely "keto". 7. It’s emotionally satisfying and promotes a proper view of food as delicious fuel. 8. It encourages experimentation with different foods, recipes, and meal combinations to find what works for you. There are no rigid rules. 9. It requires minimal supplements (maybe a couple vitamins and minerals that we should be taking regardless of diet) and is made up of real foods, not shakes or diet pills. 10. It’s sustainable. The food is delicious and carb and sugar cravings go away after just a month of so of sticking with keto. It doesn’t mean no sugar, no carbs, ever again, but it means we learn how sugar and starches affect us and make wise choices based on how we know certain foods makes us feel. In fact, a lot of keto-ers are finding that healthy carb ups are beneficial for their health. Hi Kaylyn – thanks for sharing your experience. I’m sure that someone could write the same type of response for Whole 30 or juicing or any of the other diets I listed if their experiences warranted it. I’m certainly glad your experience has been positive, but I’m not sure that everyone would or could have that same experience. Keto in that sense could easily set someone up for disordered eating if it was a triggering situation for them. That doesn’t mean it will be for everyone, but it definitely has that potential for vulnerable populations (the type of clientele I work with primarily) which is why it’s included here. I can understand much of your reasoning here, and I can respect it. However, the very fact that the Keto plan calls for ANY types of foods to be restricted is the very basis of a diet. However, I realize some individuals are on specific diets because of health reasons and such, and that’s a different story. I would be curious to wonder why you are adhering to the Keto plan? Is it for health or for weight loss? Only you know the answer, but if somewhere deep down you’re doing it for weight loss, then I would be curious to know if "breaking" the diet causes you any type of distress, anxiety, or thoughts about "getting back on the plan," after. Just some thoughts! Oh wow, thanks for these resources! 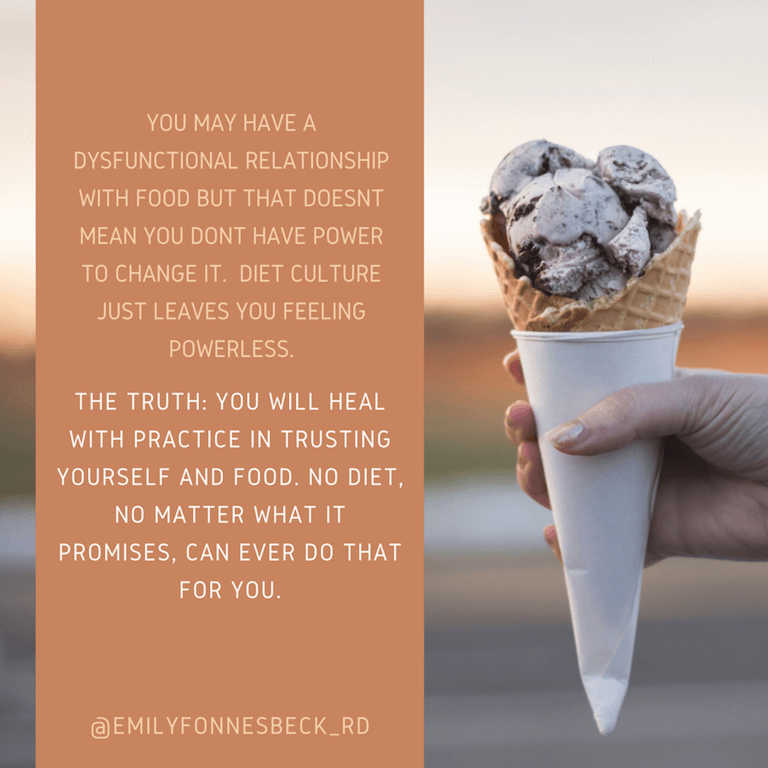 I know in my past disordered eating it would have been so tempting to fall into the trap of many diets that seem to promote health. Clean Eating was a big one for me. For the longest time my motto was "Only eat it if it has a mom or grows from the ground." I realize now that thought alone was very restrictive. There were many times I would be out with friends or with my husband and maybe Pizza would have been the only option. With this line of thought I would have believed the pizza was not okay to eat because it was a "processed" food. It would create a lot of anxiety for me trying to decide if I should or shouldn’t eat the pizza. And then when I did, I would feel guilty about it… In the grand scheme of things – pizza is delicious! I don’t WANT to live my life without pizza and any type of "lifestyle" that says I should isn’t a life that I want at all. I’m glad they were helpful, Amber! I feel the same – "clean eating" was such a slippery slope for me and you describe the anxiety and worry exactly. I completely agree about developing the confidence to say NO to things that don’t feel worthwhile – it’s like redefining what health actually means to you. Thanks for sharing!